To travel from Chiang Mai to Myawaddy in Myanmar you first need to travel to the Thai town of Mae Sot. Mae Sot is on the border with Myanmar. There are direct direct services from Chiang Mai to Mae Sot which arrive at a bus station 3.6 km from the border. Its 361 km from Chiang Mai to Mae Sot and by public bus the journey is scheduled to take 5 hours 30 minutes. Allow a further 30 minutes for the final part of the journey from Mae Sot to Myawaddy. See below for more information about travel from Mae Sot to Myawaddy and onto Yangon. There are 2 daily bus services from Chiang Mai to Mae Sot which you can book online. Express bus services are air-conditioned with an on-board toilet. The bus will stop for a short comfort break at a roadside restaurant once on route. Simply enter your travel dates and click the button to Find Tickets. Bus services to Mae Sot depart from Chiang Mai Bus Terminal 3, which is located on the other side of the Ping river from Chiang Mai’s Old town to the north of Chiang Mai Railway Station. Expect to pay 80 to 100 THB to travel from either the railway station or the old town to Bus Terminal 3 in a tuk-tuk. If you tell the driver ‘bus station’ (satanee rot bus in Thai) they are likely to understand where it is you want to go as Chiang Mai Bus Terminal 3 is adjacent to Chiang Mai Bus Terminal 2 and the major bus terminus in the city. The border crossing from Mae Sot to Myawaddy in Myanmar is open from 06:00 to 20:00 seven days a week. To reach the border from Mae Sot bus station either take a taxi or tuk-tuk from the bus station or go to the main road road and flag down a shared taxi. However, our recommendation is that if you are coming from Chiang Mai that you spend the night in Mae Sot and head across the border at first light. Its a long journey from Myawaddy to Yangon and if you want to complete that journey in a single day then you need to start early in the morning. 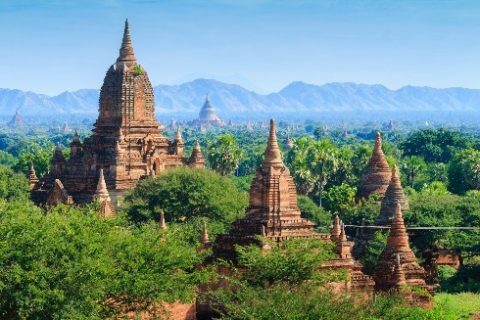 If your passport is from North America or Europe remember to apply online for an ‘e-visa’ for Myanmar at least five days before you travel because you are unlikely to be allowed to cross this particular border if you don’t sort the visa out before you get there. Bus: Direct bus services to Yangon depart from Myawaddy at 08:00, 09:00 and 10:00 although the schedule seems to vary day to day. Arrive early as you can at the bus station (on the Bayintnaung Road) and check for available seats and departure. If you are fortunate enough to get a seat on a direct bus for the same day the journey takes only 12 hours. Local Bus and Train: If you miss the direct bus from Myawaddy to Yangon, then take a local bus to Mawlamyine and go to the railway station for a train to Yangon. The journey by public bus from Myawaddy to Mawlamyine should take around 6 hours, and the train journey from Mawlamyine to Yangon a further 9 hours 45 minutes, plus however long you need to wait at the railway station for the next train.